Orient AC08004D Bambino 4 men's automatic watch features a 42mm wide and 11.8mm thick solid stainless steel case with a fixed bezel and textured push-pull crown. Orient AC08004D is powered by an accurate Japanese F6724 automatic movement with 22 jewels. This stylish watch also features a sharp looking blue gradient dial with silver tone luminous hands and index hour markers along with the 40-hours power reserve and date display functions, scratch resistant domed mineral crystal and water resistant to 30 meters. Orient AC08004D is equipped with a 22mm wide black stitched genuine black leather strap with a buckle clasp. 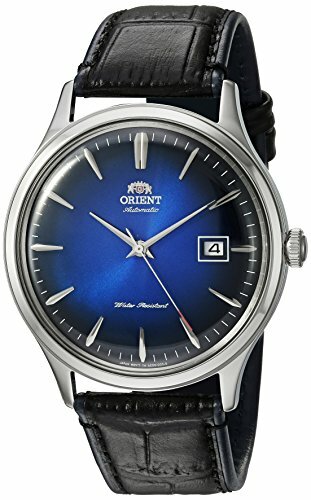 Orient AC08004D men's Bambino 4 blue dial black leather strap power reserve automatic watch is brand new and comes in an original Orient gift box and is backed by a 1 year limited warranty. On the surface, it might be easy to mistake the Bambino Version 4 with the original Bambino. For this fourth iteration of the timeless collection, we chose to move back to its roots, all the while taking inspiration from previous models along the way. Sure, the signature domed crystal is there, but unlike the original Bambino, the hour markers on the Version 4 are rounded and diamond shaped. The hands are a lot thinner (which is perhaps a hat tip to the Version 2), and the seconds hand has been partially dipped with a red accent. The sunburst dial colors are striking as well: the midnight blue and emerald models feature an ombre-like transition which is most likely attributed to the domed dial. The new Bambino Version 4 has become slight larger, moving away from the traditional 40.5mm width of previous models and instead becoming a modern 42mm across. The movement is identical to those seen in the 2nd Generation Bambino Version 1 and 2 and are completely automatic, hand-winding, hacking. The straps are also unique, especially with the use of color contrast in the leather lining.